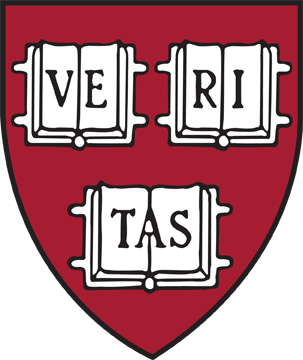 Harvard races in the Eastern Collegiate Cycling Conference (ECCC) against other colleges and universities across New England, New York, New Jersey, Pennsylvania, and Delaware. We focus primarily on road cycling, which goes from March until May, but there are opportunities to compete in collegiate track, mountain biking, and cyclocross races as well. 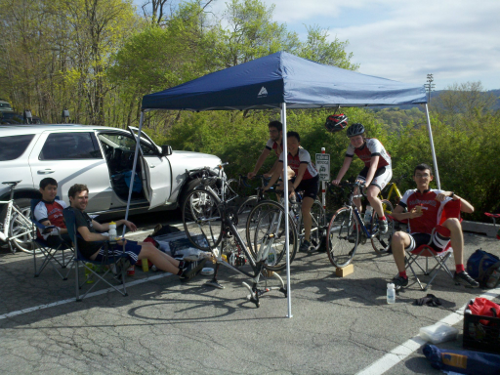 The team relaxing between races at West Point. Because bicycle racing is awesome. It will test your physical and mental limits as you try to outlast and outthink the competition. After a full season of racing, you will be surprised how much faster and further you are able to ride. You'll also put to use all of the skills that you will learn in the fall, and get comfortable riding in a tight group. But not only is racing bicycles challenging, it is a lot of fun as well. Just ask our veterans. While everyone must ride individually, helping your teammates both on and off the bike is a big part of success in bike racing, and HUCA excels in this area. Whether it's pinning numbers onto skinsuits, running to the pit to get a wheel change after a flat tire, or leading out a teammate in the sprint for victory, your HUCA teammates will have your back. Who is Eligible to Race? 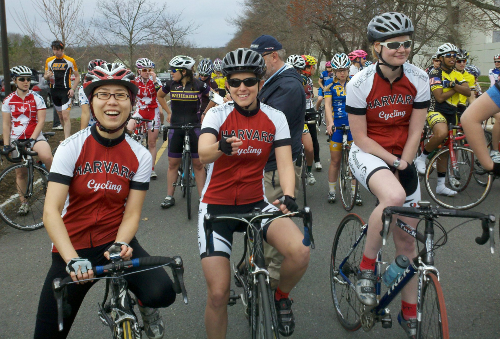 Eun Young, Eileen, and Heather at the starting line of the Princeton road race in 2012. Racing is open to any full-time student in a degree-granting program. That makes cycling one of the few sports in which both undergraduate and graduate students can compete side-by-side for their school. So whether you are pursuing your Master's, PhD, or Bachelor's degree, you can come to races and score points for HUCA. You don't need any previous racing experience to race with the team. 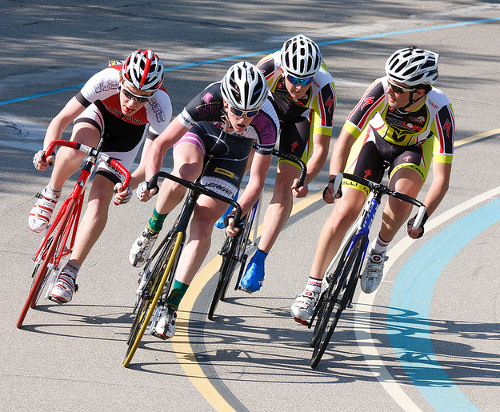 We run skills clinics throughout the fall to teach important racing skills such as drafting, cornering, and sprinting. Each race weekend also has an Intro to Racing category in each event that includes a coaching session with experienced racers. If you already have a lot of bike racing experience, the challenging A category features a very high level of competition, often with local-or domestic-professional caliber riders. 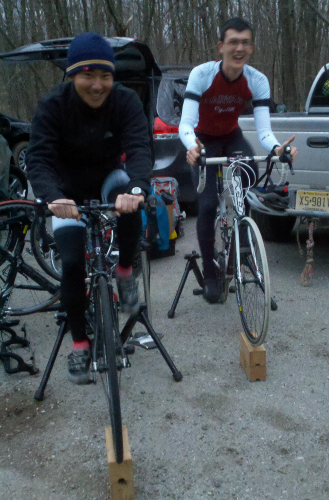 Ian and Joel warm up for a hill-climb time trial. There are four types of races in most race weekends, grouped in three categories: time trials, a criterium, and a road races. Race weekends average three events, and riders will typically compete in all of them. Individual Time Trials. Often called an ITT for short. In this type of race, riders start individually, at set time intervals, and compete for the fastest time across the course. Riders are not permitted to draft other riders. Courses generally range in distance from two to six miles. Team Time Trials. Abbreviated as TTT, in this type of race, you and up to three teammates race may work together (and are permitted to draft each other) to get everyone over the finish line faster than other teams. Criteriums. Also known as "crits", these are raced on a short course of around a mile. Racers start as a group and then race for a set period of time, between 20 and 60 minutes. This type of racing tests your technical and handling skills, as the courses usually require lots of cornering, sprinting, and tactics to succeed. Road Races. The classic road race, these courses are longer, ranging between 20 and 80 miles depending on the weekend and the race category. These courses often feature challenging hills and test your endurance and climbing skills. The ECCC also runs collegiate competitions on the track, mountain biking, and cyclocross. In track racing, riders use a fixed-gear bicycle and ride around an oval track at a velodrome, riding in a wide variety of races in a single day. The collegiate season occurs in August and September. Mountain bike racing occurs in September and October. There are two types of racing: gravity and endurance. In gravity events, you race downhill (usually after riding up in a ski lift) with a specialized bike, while endurance events use mountain bikes to race on trails after a mass start. Cyclocross season is in November and December and uses a bike that has characteristics of both road and mountain bikes. Cyclocross courses feature difficult and muddy terrain as well as obstacles that require you to dismount and carry your bike, cheered on by a rowdy crowd. Although most HUCA racers currently focus on the road, you'll find amongst our members people passionate about each discipline. "Racing is not just for some elite bike gods - it’s fun for everybody. I have a sticker on the back of my truck, right over the USCF emblem that says "Try Bike Racing" because I'm convinced that anyone who tries it will love it. "Getting started is not all that difficult: just get a bike that fits (you don’t need a super expensive go-fast bike), ride it enough to reach some level of fitness and show up for a race. Even if you only last 2 laps you will get a taste of what it's all about. "Aside from those basics, if you are participating with the HUCA group, you have the best possible start. You have a great group of supportive teammates and some really wonderful coaches who know what they are talking about and are willing to devote as much time to a beginner as they devote to a national contender. You can't do any better than that. "Don’t worry about doing well at first. Participating is what it's about. Winning is nice, but I’ve never done it (at least not since the 70’s). Although I’ve been dropped and pulled often enough, nobody has ever given me a hard time about it. Do it for the challenge, do it for the fun, do it for yourself."